Pakistani-American travel agent Junaid Mirza (50) of Brooklyn has been charged with swindling Pakistani immigrants and Hajj pilgrims of over $350,000. Junaid Mirza and his companies, Pearl USA Travel Inc., d/b/a Pearl Travel, of 1064 Coney Island Avenue, in Midwood, and Travel Treat, Inc. , formerly located in the Empire State Building, in Manhattan, was arraigned April 7, 2016 before Brooklyn Supreme Court Justice Matthew Sciarrino on a 31-count indictment. 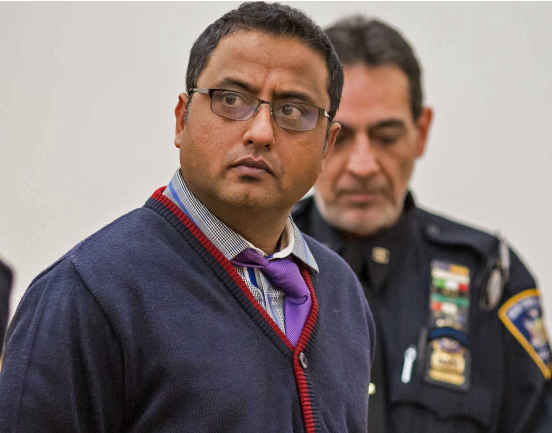 Mirza is charged with two counts of first-degree scheme to defraud, one count of second-degree money laundering, eight counts of third-degree grand larceny, six counts of fourth-degree grand larceny, 10 counts of second-degree criminal possession of a forged instrument, and four counts of issuing a bad check. Brooklyn DA’s office alleges that Mirza stole amounts ranging from about $1,075 to $14,000 from his victims. To gain the trust of his mostly Pakistani immigrant customers, Mirza spoke in Urdu to them. Mirza’s modus operandi was to guarantee low fares in exchange for payment by cash or check, which he would deposit the same day, but failed to provide airline tickets, or in some instances provided victims with receipts and printouts that he claimed were tickets. In one instance, Mirza purchased only a one-way ticket leaving his customers stranded at a Pakistan airport. Brooklyn District Attorney Ken Thompson said that, according to the indictment, between July 2011 and September 2015, Mirza at various times, owned and operated travel agencies, doing business as Travel Treat and Pearl Travel, that specialized in the sale of travel packages to Mecca, Saudi Arabia, and airline tickets to Pakistani immigrants. Mirza is said to have advertised discounted trips and tickets in popular Urdu language newspapers such as Pakistan Post and Urdu Times, and in pamphlets distributed in mosques. The Pak-American travel agent faces up to 15 years in prison if convicted. People who believe they were cheated by Mirza may call the Brooklyn District Attorney’s Action Center at 718-250-2340. Miza must be presumed innocent until and unless he’s convicted in a court of law.